I didn’t get a chance to wrap up my thoughts on the Defending the American Dream summit this past weekend, but now I can reflect a bit on what it all meant and what I learned there. First off, there were some very good speakers scheduled on Saturday’s program Outstanding among them were television host John Stossel who gave his usual well reasoned argument for why excessive taxation and government waste made no sense at all, and radio host Herman Kain who gave a rousing speech expressing the values of liberty and responsibility from a very traditional perspective which would likely win over a lot of African-American voters had any significant number been listening to him. And there were some in the audience. We even had two black bloggers in the blogger area, but even with his growing radio exposure, I wonder how many of his fellow black Americans Kain is really able to reach and shake out of their complacency. 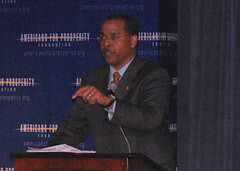 The closing address also featured an impressive African-American Republican, former Ohio Secretary of State Ken Blackwell, who got to speak to a relatively intimate crowd at the reception which closed down the conference. Blackwell has an axe to grind. He was unfairly scapegoated in the 2004 election for mistakes which were made primarily by long term bureaucrats within his administration who were mostly Democrats. Every kind of scurrilous accusation was leveled at him when Kerry lost in Ohio, and although he was cleared of every charge, Blackwell clearly holds onto some anger over the issue. His speech focused on Democratic voter fraud and he cataloged the now well-known crimes of ACORN, including one of the most coherent explanations of how ACORN’s tactics work and the confusion which they try to create and then take advantage of to allow illegal votes on election day. 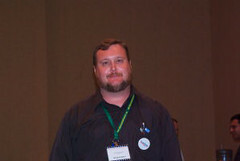 Blackwell’s experience overseeing elections makes him uniquely qualified to analyze the ACORN agenda and he did an excellent job of it. One event which I didn’t attend at the summit was the rally on the steps of the Capitol to call attention to the bailout and government irresponsibility in general. Busses were available to take attendees directly to the mall, and hundreds turned out for some short speeches and relatively dignified protesting. Congress was not in session, but at least some news media were there to report on the concerns expressed by Americans for Prosperity members. You can get a feel for the rally from the Fox News video presented below. Most of the bloggers stayed behind at ‘bloggers row’ to catch up on their writing, and several peopel shot video of the less than cinematically riveting scene of citizen journalists working at their computers. In the two videos below you can get an idea of what we were up to. See if you can pick out yours truly in the group – look for the big guy with the tiny Mac. Be warned, the first video has an annoying musical track added to it. 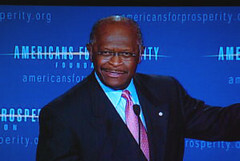 The Defending the American Dream summit attracted a lot of interesting people. Not the kinds of Republicans which the left holds in their imaginations and certainly not what most associate with the Bush administration. At one point during the closing reception Ken Blackwell began talking about the importance of traditional Republican values and the woman next to me turned and surprised me by smiling and declaring that she was a liberal. I smiled back and acknowledged that I’m one too. It was an enlightening experience. Somehow despite all the pulls and pressures and the mistakes of accepting Dixiecrats and Neocons into the party, there remains a growing core in the Republican party which holds to the values of the party from a century and more ago when the interests of business and the best interests of the people were seen as naturally allied and the philosophy of the Republican party was one of individual liberty, responsibility and prosperity. Some of them might consider themselves libertarians or independents today, but the adherent of those traditioanl values were out in force at the Defending the American Dream summit. Well represented within this group were members of the Republican Liberty Caucus, the group within the Republican Party which is working hardest to return the party to its classical liberal roots, and which shares many principles with the AFP. 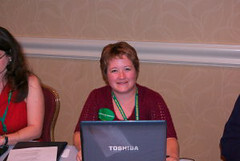 Some were there to attend the various breakout sessions and presentations and several were there as bloggers. Krystle Weeks was there to write reports for her Crystal Clear Conservative blog, which features liveblog-style reports, but she’s very prolific so you have to go a couple of pages in to find them – she’s written about 20 new articles in the last week. She’s well connected in the Virginia and Washington political community and has a lot of useful insights. 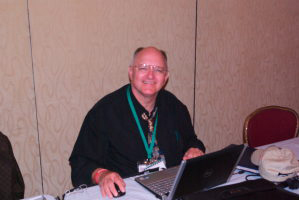 Dr. Bill Smith came up from Arkansas and was writing for his ARRA News Service which is a very useful resource for conservatives with some insightful critiques of the left. There are some really strong, hard-hitting articles on his site and I’ve added it to my regular reference sources. 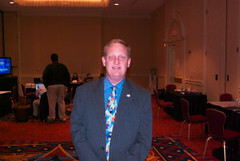 John Underwood of the North Carolina RLC was there. I hardly saw him since he was intensely immersed in the sessions and meetings throughout the conference. I did at least manage to get him to slow down long enough for a photo, which is more than I was able to manage with a couple of other RLCers who were at the conference but nowhere to be seen. I did see Aakash Raut who writes at University Blog and is with the University of Illinois (Springfield) Young Republicans. Sadly, he wasn’t around for photo time. I saw a lot more of David Baumgartner who is the RLC coordinator for Wisconsin and is working hard on getting his state’s RLC organized and chartered. He’s a very nice fellow who has taken a late-life career shift and is attending law school and expanding his political activism. I suspect he’ll do a great job getting the RLC on its feet in Wisconsin. With thousands in attendance and a high level of enthusiasm, the Defending the American Dream summit was a great look at where the Republican party and the nation might be going in the next few years. The message was positive, the dissatisfaction with the current establishment in both parties was palpable, and there were not just questions but a lot of good ideas and positive approaches to our current problems being discussed. A lot of people are talking about change this election. The left would have us believe that the change we need is towards a bigger state and more socialism and that it is embodied in Barack Obama. Yet at the Defending the American Dream summit I saw a remarkably strong movement pushing for a very different and much more positive sort of change. Americans for Prosperity has gone from nothing to an estimated 300,000 members in only two years. As they continue to grow, they are poised to emerge to political prominence in the chaos which is likely to follow after next month’s election. They may not have all the answers, but the folks at AFP and the groups who are working with them do at least seem to grasp the key message that less government and more freedom are the only way to run our country if we want to avoid repeating the errors of the current era in the future.